Advanced first aid cover (for the smaller event). ​but an ambulance on standby is not. ​or better still help in preventing one. 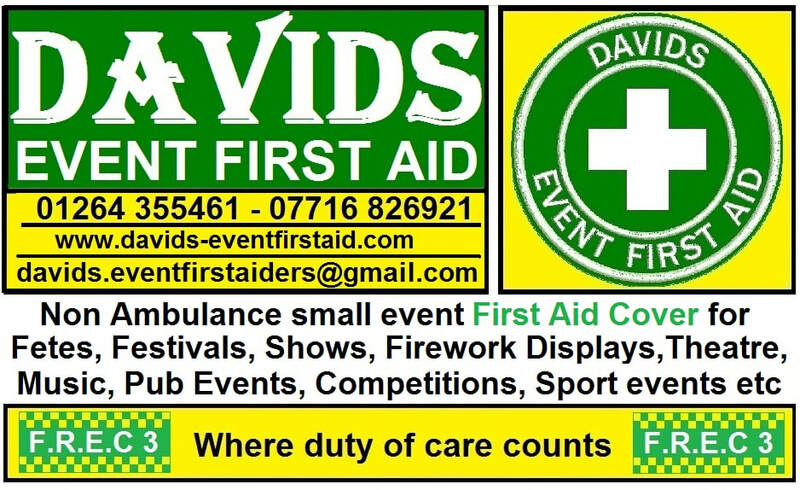 Some events need ambulances, paramedics, extra crew and staff. The higher risk of injury and difficult to get to events. a minimum rate for up to four hours and an hourly rate for any additional hours over the four. I carry vital equipment and experience for all kinds of situations that require first aid. ​and wearing clearly marked uniforms that stands out. And of course liability insurance and regular in house and outside training. first hand CPR ​and other first aid skills or simply recap from any previous training. ​This could bring added interest to your event. (A registered nurse RN, who joins in for free as and when available). £80 up to four hours cover (minimum fee) and £15 per hour (or part of) afterwards all in. So what happens if an ambulance is needed? ​given on site while awaiting an ambulance. on site while waiting for help.